Renee Treml is both a dear friend of mine and a talented illustrator-turned-author/illustrator. 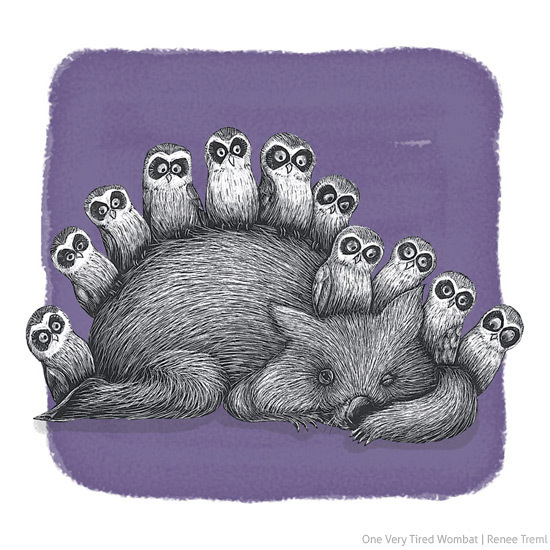 Her first children's book One Very Tired Wombat is a counting book for kids full of her incredible illustrations of Australian animals and... wait for it... is on the 2013 Crichton Award shortlist for new illustrators! What is the message of your story for kids? RT: Other than the counting theme, I wanted to show off some of my favourite (and sometimes lesser known) Australian birds. I always hope that after reading my book, a child will recognize a crested pigeon or fairy wren in the wild. 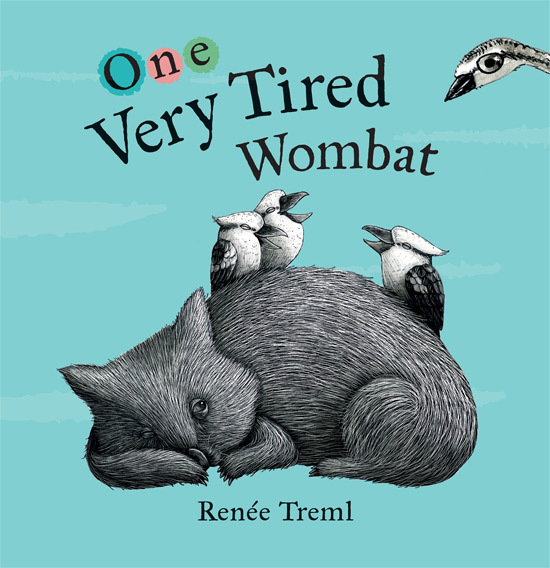 Is the Very Tired Wombat based on a real character? RT: Wombat is based on a common wombat I saw at Lone Pine Koala Sanctuary, Brisbane, in 2007 – just a few weeks after I moved to Australia. It was the first time I had ever seen a wombat and all he did was sleep, despite all the noisy children, lorikeets and kookaburras around him. I didn’t realize how impressed I was by his ability to just sleep until the illustrations started popping up in my imagination. Where did your inspiration for this story come from? 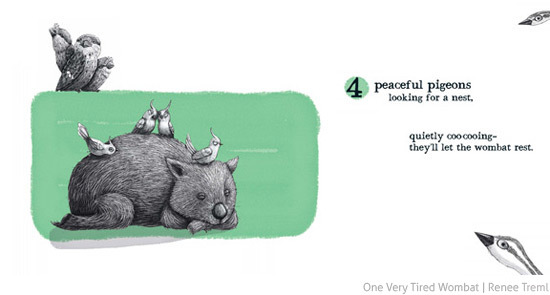 RT: The story came to life after I started illustrating the above mentioned sleeping wombat – first I drew him with one frogmouth, then two galahs, then three kookas and so on. I kept hoping someone else would come along and write me a story featuring the wombat, which I could illustrate. f course, this didn’t happen, so after my son was born I decided to try to write it myself. It took well over a year for the story to transform from a straight-up boring counting book (1 frogmouth, 2 galahs…) to the story it is now. Have you always been interested in illustrating animals, and in particular, Australian animals? How did you decide to make the transition from illustrator to author and illustrator? RT: Taking on a new title is tough – I didn’t study writing and was very unsure about claiming myself to be an author. But after Wombat was published and the second contract was signed I had to look myself in the mirror and repeat ‘I’m an author-illustrator’ until I believed it. Are there any more children's books in the works? RT: Yes! Colour for Curlews is due out in September – in fact it’s at the printers now and I’m anxiously awaiting my preview copy to arrive in a few weeks. Curlews is published by Random House Australia and follows the two curious curlews and a host of other birds as they get into mischief with my paint brushes and paint. (Of course Wombat makes a guest appearance as well.) I am finishing up two other manuscripts that feature Aussie natives and another pesky one about a cheeky owl that I just can’t seem to whip into shape. 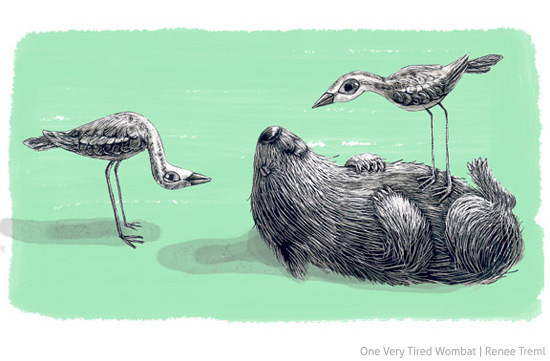 You can find One Very Tired Wombat in good bookstores including Fishpond, and Amazon. Read more about Renee Treml here on Bondville. I'm so happy for Renee. I've been a fan since our early days at BrisStyle markets. Oh my. Seriously. Where have I been - I didn't even know this was published. WOW. It's so sweet.